I must admit looking forward to this release more than the usual. Up until the Hornby 153 the only members of the â€œSprinterâ€ family available as models have been quite dated. 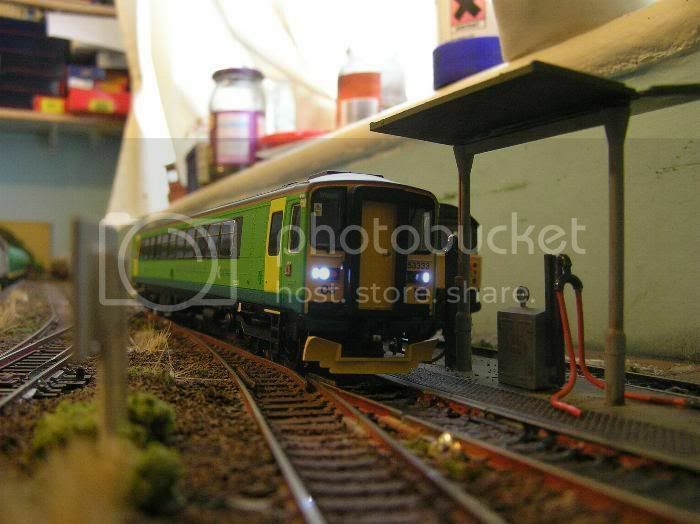 The release of the model also means that modellers wanting one for their collection will no longer have to resort to conversion using the Hornby Class 155. 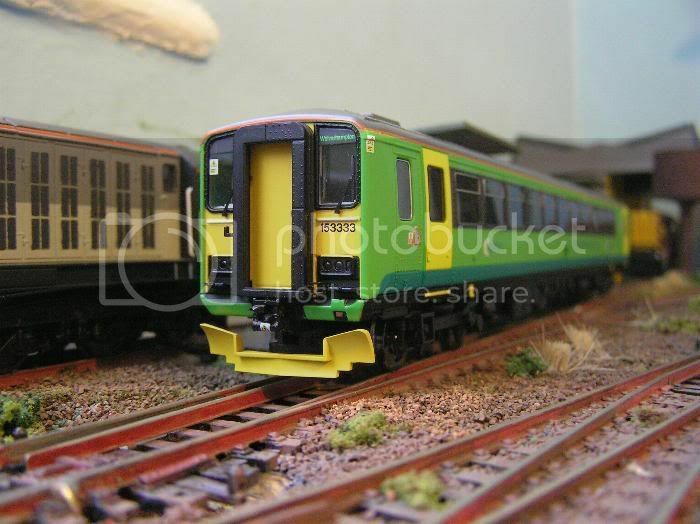 The model comes packaged in a more conventional fashion than that of models such as the Class 60 and 50 diesels. From the box it feels quite weighty, but not so much as a locomotive. It comes supplied with the companyâ€™s usual instructions, decoder sleeve and a pair of Tension lock couplings to allow for multiple working. 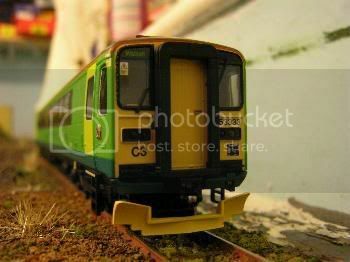 Looking at the model the impression is immediately of a quality RTR â€œSprinterâ€ to do the class justice. The odd cab ends (small and large) are well captured and detailed with the motor bobie at the small end. I particularly like the fine bracing around the corridor connections and the fine moulded handrails. The ends also feature NEM sockets, and authentic dummy couplings above these that donâ€™t have to be removed to fit the Tension locks. Slightly more disappointing are the obstacle deflectors, which, rather than being body mounted, are attached to the bogies and swing with the turns. Iâ€™d personally rather have seen body mounted versions that were removable to allow for the NEM socket to be used. The cabs have interiors (well ahead of the Lima 156) and the motor bogie is well hidden behind the plated windows. Body-wise the unit looks excellent in CT green. The rivet detail is exquisite, and really captures the feel of the real thing. The interior is moulded blue with seats and tables that appear realistic from the outside. Passengers would be a great addition and perhaps some painting to highlight certain features. Moving down to the chassis the awful box that ruined the otherwise good Lima/Hornby Class 156 is thankfully absent, instead some nice moulded detail including exhausts, air tanks and if you look closely, the drive shaft. None of this detail is picked out (the exhaust silencer should be a nice rust streaked silver) but would be an excellent detailing project. The only thing I didnâ€™t like in this area were the wheels, which appear chunky and are bright silver. If Hornby had blackened the wheels they would have looked much better. Before I could think about running the 153 I had to install a decoder. Before I even go into detail about the body removal Iâ€™d advise anyone wanting one to buy the DCC fitted version. This not only negates the need for this migraine inducing task, but might also eliminate the back EMF calibration issues that turned up with my bachmann decoder. To remove the body, you need to ease it away from the chassis, bearing in mind that the seam is so fine and well hidden that you can hardly see where it is. I found it easiest to start at the â€œsmallâ€ end (where the motor bogie is) and apply pressure to the raised ridges over the bogie mounts until enough of a gap emerged to wedge in a small strip of plastic. Repeat on the other side at the same end then lift out the chassis at that end and slide the strips along to help prize it out. Once youâ€™ve done it once itâ€™s easy to do again (or you could buy the Decoder fitted version). With the decoder (Bachmann 3 function) installed my sample ran erratically at slow speeds, a back EMF problem. Disabling it produced little result, so I adjusted CVâ€™s 53 to 55 in order to tune in the decoder. Once again, the DCC fitted version might save you the hassle. When it finally ran the unit was very impressive. The lighting is both markers and one headlamp on the leading end and red tail lights on the trailing end. The blue-white lights arenâ€™t strictly prototypical (white-gold) and there is no day/night switch, however they still look fantastic. Another first for an RTR Sprinter. While it is a commendably smooth runner, the unit is highly sensative to dodgy track laying and doesn't quite seem at home on 2nd radius curves (although make no mistake it will run through them if your track is well lain). 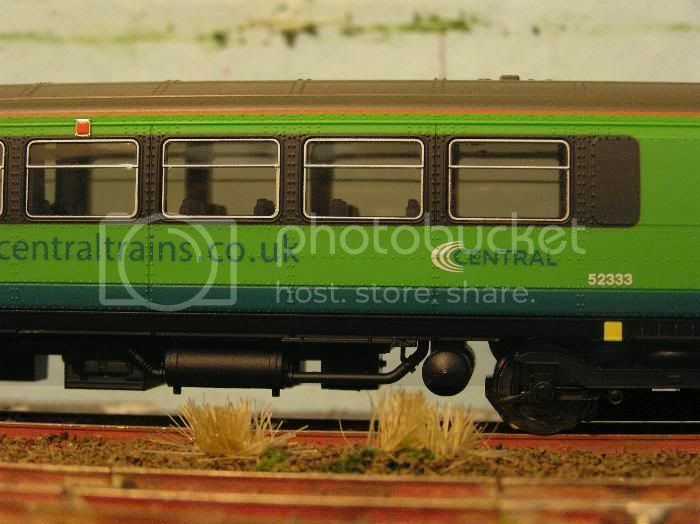 This is quite dissapointing, considering how many "space starved" modellers would like the single car and how well older sprinters have stood up on curves. Overall, despite itâ€™s sensitive running, bogie mounted obstacle deflectors and shiny wheels this is a superb model, and the first â€œSprinterâ€ that should satisfy most from the box. With Bachmannâ€™s Class 150 coming soon (or in 2145 ) itâ€™ll be an interesting comparison, especially since Hornbyâ€™s rival seems to have both blackened the unitsâ€™ wheels and fitted body mounted deflectors. Against- bogie mounted deflectors, shiny wheels, body difficult to remove, doesnâ€™t like tight curves. underframe and rivet detail on 153333. Not a bad looking model, but that snow plough looks to be sitting too low on the model, unless there's a NEM pocket mounted on the bogie ? Yep, there is. The ploughs are too low by those pics.